Beat This Caption Contest 91 Winner – Caption Contest Funny Clever Witty Enter Today! They don’t call her ‘Wishbone’ for nothing! 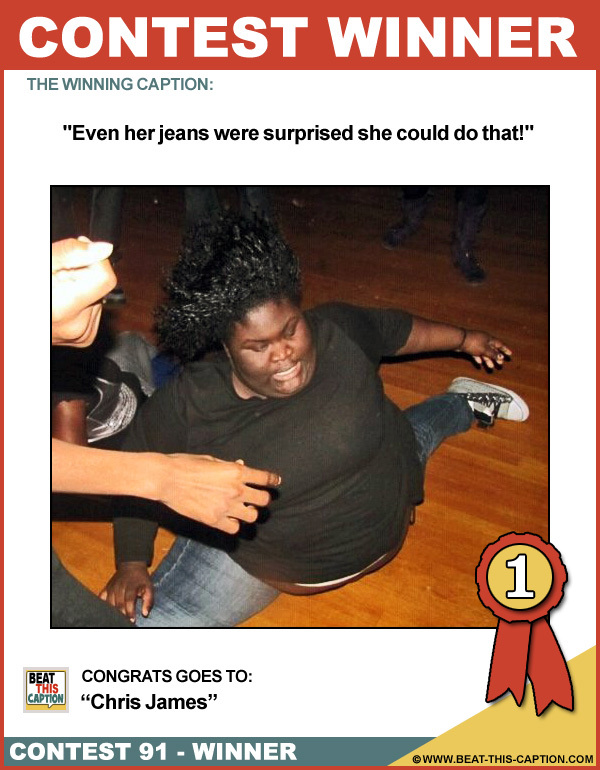 Even her jeans were surprised she could do that! Great Caption! You made me laugh at the office and everyone thought I was crazy! :) You WIN! Nope. Still can’t tie my own shoes! Not many women can make a whole stripper pole disappear like that! Sally was stuck, and needed a Camel Tow! How about a little choclate split for your banana boouuuy? Holy Crap, I’m suction cupped to the floor!!!! After hearing the D.J. yell “Ho Down”! Fat Albert taught me all my moves! While she was trying to get up, Harry tried to turn the knob to get KABL FM! These tryouts for cheerleaders are brutal!